1.0.1 Nuisance birds can really be a, well, a nuisance. It’s hard to say why a flock of blackbirds or pigeons decided to turn your Kingwood Texas home or business into a nature preserve. All you know for sure is that you’re ready for the birds to find somewhere else to poop. Don’t worry. The Critter Team can solve all your nuisance wildlife problems. The Critter Team is a professional wild animal management company specializing in bird removal, bird control, bird exclusion and bird proofing solutions for residential and commercial customers in the greater Houston area. Nuisance birds can really be a, well, a nuisance. It’s hard to say why a flock of blackbirds or pigeons decided to turn your Kingwood Texas home or business into a nature preserve. All you know for sure is that you’re ready for the birds to find somewhere else to poop. Don’t worry. The Critter Team can solve all your nuisance wildlife problems. The Critter Team is a professional wild animal management company specializing in bird removal, bird control, bird exclusion and bird proofing solutions for residential and commercial customers in the greater Houston area. Whether you have a flock of Canada geese soiling the premises, birds in attic, bird in chimney or birds in vents, we can help. The Critter Team knows how to convince those Wild birds not to roost on your signs, building ledges and overhangs. Nuisance birds can create a mess, spread disease and damage stone surfaces. The Critter Team is a professional wildlife management company specializing in the removal and control of all wild animal species, including birds, snakes, skunks, rats, armadillos, raccoons, bats, squirrels and more. We can devise habitat modifications, install bird management products and perform building alterations to permanently solve your nuisance bird problem. Call The Critter team at 281-667-0171 to speak with a bird management expert. Make sure you call The Critter Team as soon as you hear the sound of scratching and fluttering coming from your HVAC system, bathroom, kitchen or laundry room. It’s likely that a nuisance bird built a nest in one of your ducts, pipes or vents. The nest and birds should be removed right away. If you wait too long, you’re going to have a nest full of hungry baby birds on your hands. That means that there’s going to be a lot of chirping and pooping going on. You won’t enjoy the racket, but the smell is even worse.Make no mistake, bird feces is a source of Bird Flu and a variety of other diseases. Nuisance birds are also carriers of fleas, mites, fungus and bacteria. Wild birds and other nuisance wildlife should never be allowed to remain in your home or business for long. Call The Critter Team for professional bird control and bird exclusion services in Kingwood Texas. The Critter Team can install bird spikes, seal ventilation pipes and install screen to keep those nuisance birds from damaging your property. Wild birds tend to roost on building ledges, the corners of buildings and other convenient locations. The Critter team will remove those dirty birds from your home, business or industrial facility. Nuisance birds are one of the more difficult wildlife species to remove and control. Only an experienced professional wildlife management company has the expertise to alter the environment so that nuisance birds are no longer attracted to your home or business. 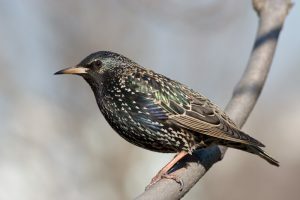 Some of the more troublesome Kingwood TX nuisance bird species are the common grackle, pigeon, sparrow, starling, Canada goose, woodpecker, chimney swift, seagull and several blackbird species. The Critter Team is a leader in the wildlife management industry. We specialize in bird trapping, birds in attic, birds in chimney, bird exclusion and bird proofing in Kingwood Texas and the greater Houston area. Call The Critter Team today at 281-667-0171 to schedule a bird removal and bird exclusion appointment. The Critter Team is a veteran owned business that offers humane wild animal removal services, affordable prices and unrivaled customer service.